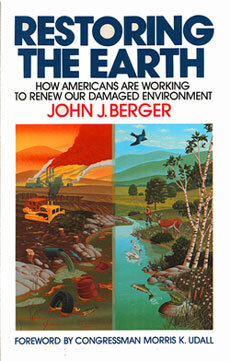 Restoring the Earth | John J. Berger, Ph.D. Restoring the Earth introduces us to dedicated individuals and groups who have worked, and are working—privately, voluntarily, and often successfully—to repair and restore those damaged natural resources that are so crucial to our present well-being and our future: our water, our land, our wildlife, as well as the cities and towns in which we live. Among the people we meet are a housewife who led the fight to clean up a river in Massachusetts . . . a California pharmacist who saved a redwood forest and who has, with the help of friends, planted 10,000 trees . . . a Pennsylvania mine inspector who repaired strip-mined lands . . . a Wisconsin architect who saved a town afflicted by severe floods and redesigned it as a flood-proof solar village, America’s first. We watch as a small town in Michigan takes on a giant multinational chemical company whose toxic wastes have poisoned their groundwater . . . as a plumber on Cape Cod works to transform a brush-choked ditch into a trout stream like the one Daniel Webster once enjoyed . . . and as a daring, imaginative group of biologists in California routinely risk their lives to rescue an endangered falcon species from extinction. And, finally we are offered proposals—for making existing human settlements more ecologically sound as well as more enjoyable places to live in. Restoring the Earth goes beyond traditional conservation and preservation—it offers the message that something really can be done about the pollution and destruction and waste familiar to all Americans. It should hearten those already committed to environmental causes and offer hope to those who think these problems are beyond solution.